It's so crazy that it was only 10 or 12 years ago, there were only a few teams that were competitive in World Championships. Now after watching the 2011 WWC it's very clear how the game of soccer has evolved around the world. The quality of football in every group of the WWC was much improved. France, England, Australia and Japan-to name a few, had fine tournament performances. There were also a few big surprises. After talking to my current Boston Breaker teammate, Alex Scott, who is also a right outside back for the English National Team, here are some of her thoughts on playing in WWC. Germany, the host country who had been playing some of the best football in the world was beaten by Japan in the quarter's.This happened even though the federation put a huge amount of dollar's and dedication into preparing for the World Cup. They even stopped their players going from other leagues around the world the last 3 years. Canada going 0 for 3 after spending the last 6 months in residency camp in Rome. Coaching decisions in a few games- BIG ONE. 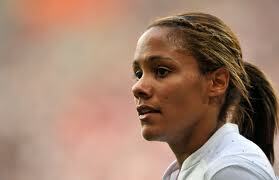 Hope Powell for England subbing out 2 starting outside backs and mid with 10 minutes to go in quarters. Brazilians playing 3 in the back but w/a sweeper and marking backs. played great and turned people's heads. The best part of WWC was quality and progression of football around the world. More federations have put $, support and focus on their women's teams. Germany kept all players in Bundesliga, paid them more $ and did an unbelievable job marketing the WWC all over the country and world. This WWC will go down in history as the best ever. They put on a great show. What is even more exciting is the competitiveness and parity among the countries all over the world. Lastly, thank you to ESPN for the amazing coverage throughout the tournament.